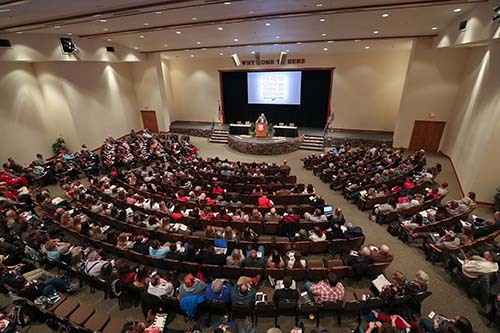 More than 400 people gather at College of the Ozarks today for the 2019 S. Truett Cathy Poverty Summit, held in The Keeter Center’s Royal Oak Forum. 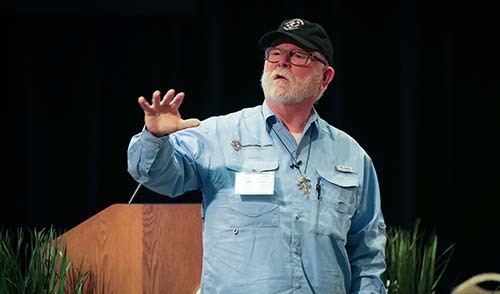 Nationally known speakers — Ron Hall and Alan Graham — provide inspiration and the backdrop for area educators, business leaders, and community members to learn and share concerns and experiences. Alan Graham, founder and CEO of Mobile Loaves & Fishes, speaks to those gathered at College of the Ozarks for the annual S. Truett Cathy Poverty Summit. POINT LOOKOUT, MO. 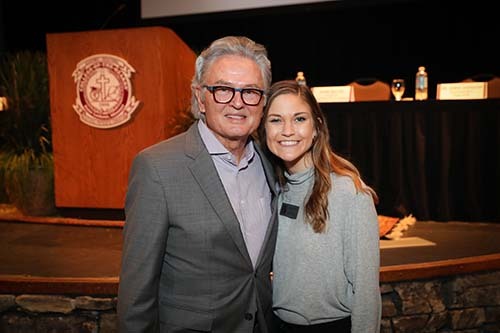 — More than 400 people gathered at College of the Ozarks today for the 2019 S. Truett Cathy Poverty Summit, which was held in The Keeter Center’s Royal Oak Forum. 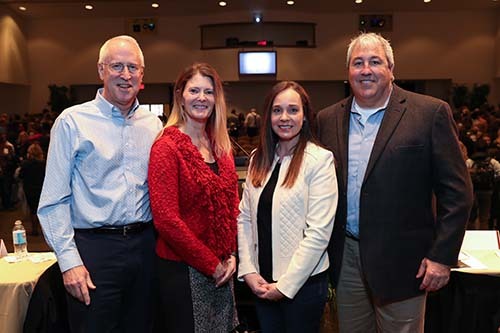 Nationally known speakers — Ron Hall and Alan Graham — provided inspiration and the backdrop for area educators, business leaders, and community members to learn and share concerns and experiences. As part of the morning schedule, a panel of area practitioners presented the current state of poverty initiatives in Stone and Taney counties. During lunch and the afternoon session, participants took place in a guided workshop to continue the discussion about poverty in this area. The goal was to gather input from a wide cross section of stakeholders in a guided “community conversation,” which will serve as the kick-off of numerous small group discussions during 2019. This community feedback will be part of a report, which will provide a roadmap for action steps for reducing the rate of poverty in the region. Ron Hall was one of the featured speakers for the Poverty Summit and also spoke at a convocation for students last night, Jan. 31. Hall is a screenwriter and producer of the movie version of his book, Same Kind of Different As Me. The book is based on Hall’s relationship with Denver Moore, a homeless man he encountered at a homeless shelter where Hall was volunteering. During the Poverty Summit, Hall described the day he met Denver. Hall had imagined his legacy centering on his success as an art dealer. However, God had a different plan in mind. Hall said many people judge a city by its architecture, its art, its attractions, but God judges a city by how it takes care of the poor and the homeless. After the death of Hall’s wife in November 2000, Moore moved in with Hall and lived with him for the next 10 years. The book, Same Kind of Different As Me, stayed on the New York Times #1 bestseller list for more than three and a half years. Alan Graham, founder and CEO of Mobile Loaves & Fishes, was also a featured speaker. Since its founding in 1998, Mobile Loaves & Fishes volunteers have served more than 5 million meals with a side of hope to homeless men and women living on the streets of Austin, Texas. With the support of more than 20,000 volunteers, Mobile Loaves & fishes is the largest prepared feeding program to the homeless and working poor in Austin. Graham is also the visionary behind MLF’s Community First! Village — a 27-acre master planned development that provides affordable, permanent housing and a supporting community to the chronically homeless in Central Texas. College of the Ozarks students — including education, nursing, and family studies majors — attended today’s summit, along with members of the campus and local community.